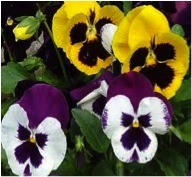 It is time for planting pansies. Pansies like well-drained soil, cool weather, and partial shade to full sun. Fertilize them every other week with Blood Meal (12-0-0) or manufactures recommendation. At J & N Feed and Seed our greenhouse if full of colorful pansies. Plant them now and enjoy the vibrant color for months to come. This entry was posted on Thursday, October 31st, 2013 at 10:43 pm	and is filed under News & Updates. You can follow any responses to this entry through the RSS 2.0 feed. Both comments and pings are currently closed.